I got my ham license about two years ago, but never really did much with it despite intending to do otherwise. I managed to finally reach a turning point regarding that when I picked up a gently used Kenwood TM261A (and a power supply) from a local Craigslist seller. As a budget-minded individual, I decided to try constructing my own antenna before buying one. The basic ground plane antenna described in the ARRL Operator's Manual seemed like a pretty easy place to start, so I went with that. 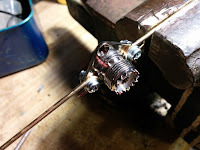 My build consists of three pieces of brazing wire connected to a SO-239 connector. First I went about making loops so that the ground plane wires could be connected to the SO-239. I bent small L shapes with a bench vise, then squished them into something I could connect with a screw. 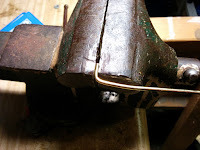 I then soldered a third section of wire to the part of the SO-239 that connects to the core of the coax using a propane torch. I neglected to take a picture, but I doubt the complexity of the operation will astound you. After running some 50 ohm coax up to the attic, I secured my new antenna in place with zip ties. I am now able to hit a repeater about 15 miles away and am getting reports of good audio. As time (or money) allows, I'll probably either build or buy a J-Pole. Regardless of this, I'm happy for the time being.